I didn’t much like 2015’s Star Wars: The Force Awakens—or, rather, I liked it as much as someone can like an anodyne and likably forgettable bit of nostalgia bait. My opinion was not shared by humanity, and there was every reasonable expectation that Disney (the property’s owner since 2012) would produce a follow-up carefully engineered to appeal to a traditionalist fan base while broadening and updating the franchise to reflect a different cultural and political landscape (anyone who thinks that every earlier film in the series didn’t seek to do the same thing hasn’t been looking very closely; how well each of them do it is a different story, and beyond the scope of this review). They’ve failed pretty miserably at fulfilling that expectation, judging from the divisive and downright icy reaction from moviegoers. I expect this will become known in the near future as the “bad” Star Wars sequel, before J.J. Abrams comes back in 2019 to make things right again. Of course, the same thing happened with The Empire Strikes Back in 1980, wherein a legion of fans (and critics) enthralled by an opening chapter came away from the first sequel irritable or indifferent, before the third movie brought everything home for them. It was only after time and some perspective that the second film gained its status (rightfully) as the best of the series, with the third film (rightfully) coming to be regarded as the weakest. The makers of The Last Jedi absorbed some of the philosophy that went toward making the 1980 film a different beast than its predecessor, with a similar result. This is a better film than The Force Awakens: more assured, more textured and driven in what it’s feeling and thinking, and far better-looking. The movie coalesces around three principle themes: the failure of great expectations, the weight of lineage, and the folly of hero worship. 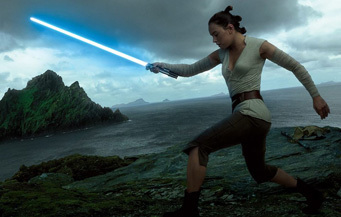 These manifest in the main storyline: Daisy Ridley’s Rey, the protagonist of the first film (seventh? Last? Whatever), travels to the most remote planet in the galaxy to locate the self-exiled Jedi Luke Skywalker (Mark Hamill), to learn the ways of the Force and/or recruit him back for the good of the Rebellion Resistance fighters. In a separate plot, the remaining good guys are on the run from the Empire First Order antagonists, led by General Leia (the late Carrie Fisher, thankfully allowed to complete her arc without any of the horrific CGI augmentation from last year’s Rogue One); the Order decimates their planetary base in the movie’s opening, so much of their story is spent trying to locate a new planet to base operations from. Along is pilot Poe Dameron (Oscar Isaac), prone to impulsive acts of high-wire risk either with or against orders, and Finn (John Boyega), sent on a recovery mission in order to exploit a flaw in the tracking system being used against their ships. Finally, there is Kylo Ren (Adam Driver), student of the Dark Side of the Force, apprentice to Supreme Leader Snoke (Andy Serkis and a lot of mo-cap sensors, giving weight and menace to a thinly-written character). There’s a lot going on here at the level of raw incident, and the movie skillfully cross-cuts between four different storylines—enough so that you don’t quite notice how hours of plot with the Resistance and First Order are made to coexist along with days (at minimum) of plot with Rey and Luke—up until a final hour that brings all of them to a head in the same place. Cross-cutting between simultaneous climactic setpieces is an underrated art, something that the Star Wars franchise has been good at even in their lesser entries. Here, we get something rhythmically new: the different plots run into each other, mostly resolve, and then the principal conflict for all intents and purposes restarts in a new location, with different stakes and different key moments. The last time I saw a movie cycle up again after this explicitly cycling down was over twenty years ago, in the final Lord of the Rings installment. Here, it arguably works more to the film’s benefit; there are notes and hints at character threads left hanging for Episode XIV which are given some degree of absolution here instead.